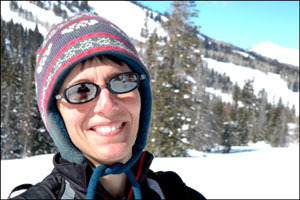 Adrienne Aldous has a deep fondness for Brighton, Utah. Her roots are in Brighton. She currently owns Mount Majestic Properties, a business dedicated to marketing Brighton as one of the foremost skiing destinations in the United States. Which it is. Adrienne Aldous’ connection to Brighton, Utah dates back many generations and begins with her great grandfather, James H. Moyle. When he was a young boy, he immigrated to the United States from Scotland with his family when converting to the Mormon faith. He traveled west to the then-territory of Utah with a group of pioneers. Moyle fell in love with Brighton when he first visited the area in 1887 with his bride-to-be Alice Dinwoody and her mother Catherine, who was acting as chaperone on their excursion into the Wasatch Mountains near Salt Lake City. It was fashionable at the time to visit the mountain village of Brighton as a respite from the city heat during the summer months. It was suspected that James was trying to create a favorable impression on this distinguished furniture making family. While today Brighton is just twenty-five minutes by car from Salt Lake City, it was then a truly arduous adventure. The three travelers first rode the railroad which ran from Temple square to the granite quarry at the mouth of Little Cottonwood Canyon. There they boarded a frightening mule-drawn tramway, which ran to Alta, a busy mining camp at the head of that canyon. During this 9 mile ride they marveled at the beautiful mountains surrounding Alta and Brighton. In Alta, their baggage was loaded into a heavy mountain wagon while the three of them rode horse back over Twin Lake Pass, past untouched crystal lakes and down the winding trail to the small hotel that stood near Silver Lake in Brighton Village. Their luggage was offloaded at the steps to the hotel and the guests retired to their rooms to freshen up after a long tiring journey. Little did Moyle know that he would one day own that hotel when misfortune struck it’s current owner. Her great grandfather’s second trip to Brighton occurred just a few years later while his first child was still a baby. His new family retraced their courtship journey to Silver Lake via the Little Cottonwood Canyon tramway. From Alta their baggage was hauled by wagon while they walked most of the way over the summit and down to the hotel run by William S. Brighton and family. The Brighton boys were prospecting the surrounding mountains for semi precious metals which unfortunately for them never amounted to much. Along the way, they did amass a great deal of land and became the local merchants and lodging hosts for guests. The Brighton Hotel was a simple building constructed of rough-sawed timber. The ten guest rooms were rustic, with newspapers and magazines pasted to the walls. Mrs. Brighton did the fishing and cooking, which was always a sumptuous meal despite the roughness of her surroundings. James and his wife dreamed of having a place of their own in Brighton. The Brighton’s, who had patented the greater part of the Silver Lake area, had sold home sites to several Salt Lake City families. It was not long before Moyle negotiated for the purchase of an acre of land near the hotel and began to build his own mountain retreat. He proudly constructed the first home of planed lumber ever built in the area, which fondly became known as “the cottage”. Eventually when logging got a firm grip on the area, the road up to Big Cottonwood Canyon was improved to a point where it was no longer necessary to take the lengthier route via Little Cottonwood Canyon to the south and over Twin Lakes Pass. Now it only took 8-9 hours by team from Salt Lake and as a result interest in Brighton peaked to an all-time high. After Adrienne’s great grandfather built the cottage, Mr Brighton’s business fell upon hard times. Encouraged by a major lumber dealer to enlarge the hotel, Mr. Brighton mortgaged his property in the city and constructed a new hotel consisting of 54 guest rooms, plus a large dining room with dance hall. The first tragedy to befall Mr. Brighton struck with the death of Mrs. Brighton who had been the genius of the enterprise. Then, a year later, Mr. Brighton himself died. As foreclosure loomed, the Brighton family, who were clients of the Moyle law firm, offered the property to Adrienne’s great grandfather. Thus, James H Moyle came into possession of much of Mr. Brighton’s holdings in the Silver Lake area. As the new owner and manager of the hotel, her great grandfather made a number of renovations including the addition of a bowling alley for guests of the Brighton Hotel. Generations of family continued to enjoy the Moyle cottage until the summer of 2007 when walls were beginning to lean and leaks were too numerous to repair. The cottage was demolished and is currently being rebuilt with modern amenities by a family cousin Linda Burbidge. James, Adrienne’s grandfather, was very keen on preserving the history of Brighton. He wrote a book about his remembrances with a significant portion pertaining to Brighton. In 1996, Adrienne and a neighbor friend decided to share the history of Brighton by organizing a home tour of the old and new homes in the Brighton village. This tour was sponsored by the Utah Heritage Foundation. As a result, Adrienne became close to many of the long-standing property owners and got the idea to start a property management company to rent these homes to out-of-state ski visitors. Many of the home owners in Brighton were finding that the increasing costs of maintaining land in Brighton was becoming prohibitive and welcomed extra income with periodic rentals. Since Adrienne was one of the few who lived in Brighton year-round, it made sense that she rent and manage these homes. Back when Adrienne’s great grandfather was falling in love with Brighton’s mountains, he had no idea that Brighton itself would some day be famous for winter sports. That is where the Wasatch Mountain Club and its original members enter the picture. About 30 odd years after James H. Moyle’s cottage was built, these energetic souls began the sport of skiing in Brighton. There were no lifts in those days. Instead, groups would travel to Park City, climb up over the ridge tops and ski down into Brighton. Routes from Park City to Brighton became so popular that the club marked them with signposts displaying the club’s insignia. “I can only imagine the sophistication of the “boards” tied to boots that got these people up then down that rugged and ungroomed terrain”, Adrienne muses. In 1936, the Wasatch Mountain Club built the first rope tow at Brighton near their overnight lodge. This new sport was short-lived for many as men were called to duty in WWII. Zane Doyle, a meat cutter from nearby Hill Air Force Base, had a vision. Unbeknownst to his wife, he bought a 1,440 foot long T-bar lift built by a local enthusiast near what is today the Alpine Rose Lodge. It had been sitting idle since WWII had erupted. Thus was the birth of Zane’s life in the ski business. Legend has it that the first time Doyle turned on the power, a lift tower collapsed. That was the beginning of many ups and downs for this family, but Zane Doyle’s never-give-up attitude and true resourcefulness got him through the tough times and over the years he continued to install more lifts and gradually increased the size of Brighton Ski Resort. In the winter of 1947-48 a 4,000 foot long, 1,100 foot high Millicent chair lift was erected. It was lauded by the Intermountain Ski Association as one of the best constructed chair lifts in the United States. 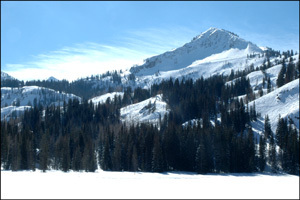 Today, Brighton Ski Resort has 1,050 skiable acres with all terrain accessible by high speed quads. In addition, freestyle riders and skiers enjoy Brighton’s four terrain parks as well as 22 runs over 200 lighted acres for night skiing. There are three restaurants and a slope side lodge for guests. Thanks to Mother Nature, and Zane Doyle, Brighton has become a year round destination for people around the world, and I am proud that my neighbors have opened their homes so that others can experience the wonder, peace and beauty of Brighton, Utah.